Access to high quality coaching in a range of sports.  Professional development for staff to enable them to teach PE more effectively.  Specialists teachers and coaches to broaden the pupils’ experience of other sports.  Additional PE resources to support the delivery of high quality PE. In Year 6 we currently have 59% of children who can swim the currently recommended 25 metres. Well done to all of the children who took part in the cluster hockey event at RWBA. The children all played very well as a team and showed great sportsmanship. Congratulations to the team of swimmers who took part in the cluster swimming gala. They showed great sportsmanship and excellent perseverance when supporting their team. They were also pleased to see our friend Olympic Swimmer Jo Jackson again. We were very pleased to welcome the Swindon Wildcats to school. The children learnt lots about the value of perseverance and how the Wildcats work together as a team. Congratulations to our Ks1 footballers who took part in the first cluster event of the year. They all showed excellent sportsmanship playing against other schools from within the cluster. Over the past year the staff have worked with different experts to support delivering PE and sport at St Bartholomews. We spent the term working with experts from Swindon Town FC, Ali from RWB tennis club showed us how to deliver tennis, Phil Smith from RWBA worked with us on challenging our children and Mr Brereton showed us the different apps that can be used on the iPads to support learning. 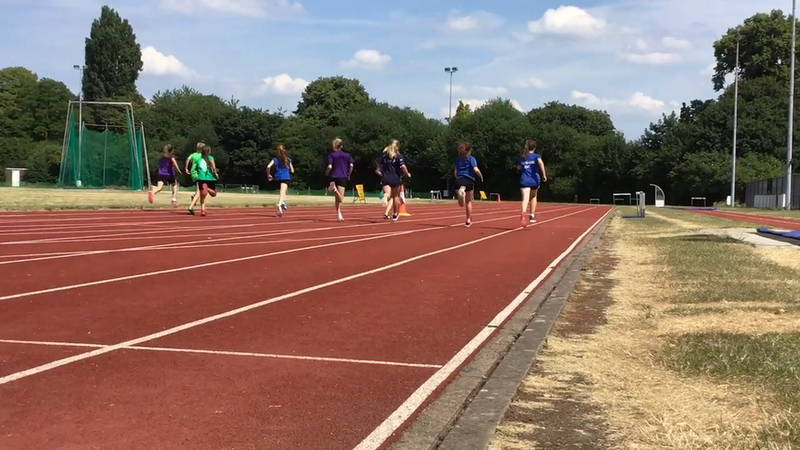 On a very hot day this term 14 children took part in the cluster athletics event. 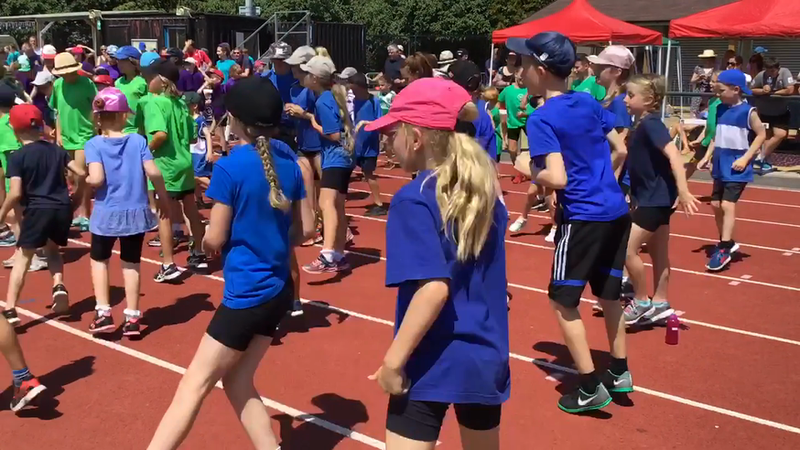 They competed in a throwing event, speed bounce then short, middle and relay track events. Well done to all of the children who took part and showed great sportsmanship. We were lucky enough to take a team of 15 children from ks2 on an adventure and problem solving day. The children worked fantatsically as a team and took part in problem solving tasks, fire lighting and canoeing. The highlight was when one canoe tipped over and 3 ended up in the lake, but they showed amazing perseverance and got straight back in, even though they were a bit soggy!! Well done to our Year 5/6 cricket team who played in the cluster event at the beginning of June. They played 5 matches winning 4 of them. Out of the 8 schools St Bartholomew’s came 2nd! Well done to all of you. In May two tag rugby teams, one from Year 3/4 and one from Year 5/6 attended the annual cluster event hosted by Royal Wootton Bassett Rugby Club. Both teams showed excellent teamwork and sportmanship. We were incredibly proud of our Year 5/6 team who came 1st for the second year in a row and brought the trophy back to school. They then went on to play in the county finals at Devizes Rugby Club coming third in their group. We supported Sports Relief this year by challenging each class to do as many steps as possible in a week. The loosing classes from each phase saw their teachers cycle their way through Golden assembly. The winning groups joined Miss Lawrence for a fun dance session and wore their own shoes to school to award their amazing feet! Together we raised over £200 for this amazing charity. Congratulations to our dance team who showcased their Jive at the cluster event alongside 9 other schools. Some of the children have been joining in with Joe Wicks Fitness Week. We have had great fun joining in with the movements. We were amazed to hear Joe do a shout out for St Barts! You'll find it on Wednesdays session at about 15 minutes on You Tube! A massive congratulations to our Hockey team who came 3rd in the recent hockey tournament at RWBA. They showed fantastic sportsmanship and worked brilliantly as a team. Well done to all involved. A team of Year 5 and 6 swimmers took part in this years swimming gala against 7 other schools. The 12 children worked fantastically as a team to support, encourage and celebrate their achievements together. We were very proud when they were announced in 4th place. Well done to all of them!